Buddy The Wayward Wolverine is based on the real life lone wolverine living in California. Nobody knows how he got here. He is related to the wolverines of the Sawtooth Mountains of Idaho. This is the fantastical tale of Buddy’s journey. Written by Maryᴀ Livingston, The Backdoor Artist, and Amanda Shufelberger, the main Buddy biologist. Illustrated by yours truly the Forester Artist. We will be at a book signing at the Whole Earth and Watershed Festival, in Redding, California at City Hall on Saturday, April 27th from 10am to 4pm. Come down to the Red Tail Publishing booth if you are in the area. 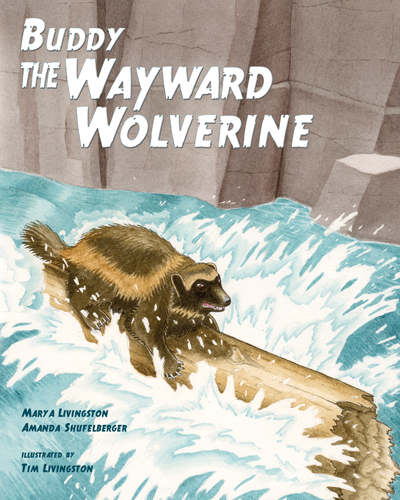 Buddy The Wayward Wolverine is also available at REDTAIL.COM. This entry was posted in Watercolors, Wildlife and tagged art, Buddy The Wayward Wolverine, children's book, story book, watercolor, watercolour, wolverine by foresterartist. Bookmark the permalink. Buddy sure is clinging on for dear life there in that icy looking canyon river ! I had look at your links What a great collaberation between you all . Thank you Poppy. Buddy was a fun project to do. I’m sure it won’t be the last we will hear from Buddy either. As for the weekend it will all get better. We soldier on. Very very cool!!! A bit of a travel for us… But very cool. We will have to check this book out for sure! How truly exciting for you and your family!!!! Thank you so much. We had a lot of fun doing it. Thank you Helen. We are back from book signing and it went very well. It is good to have it done and out. Now on to the next project. The folks at Red Tail say they are working on it. I will pass along you comments. I would love to to attend but I am very far away from there. Anyway keep us informed. And the illustration is beautiful. Congratulations and much success. Thank you so much Mirna. I found it quite moving. Thanks for sharing Alli. I had heard of the Michigan wolverine, but had never read the account. They had a lone female and we have a lone male. Like two ships that passed in the night. Congratulations to you both, Marya and Tim! 🙂 🙂 🙂 A cover is amazing. It was indeed. Although, these projects are always grueling, so I’m glad it is done. Now time to move on to the next one! How much fun is this! Congratulations. I hope you had a great time at the book signing. The project was really fun. The book signing went great. Although, be the end I think it was about 95 degrees out and it was an outside event. That isn’t a bad temp around here, but for April 27th it was a bit early. So cool. I am definitely going to have to get a copy for my grandson! Congrats!!!! Thank you Shawna. I haven’t forgotten your photo. Congratulations on a fine project! The illustrations shown on the Redtail link looked very good and the book and related videos tell a fascinating tale. Being from the UK I had to check the locations, but Idaho is a fair distance from California. Buddy seems quite at home in the snow of Sierra County, in the videos at least. Thank you Paul. It is quite a mystery as to how Buddy came to be in California, but we sure had fun coming up with our version of his story.